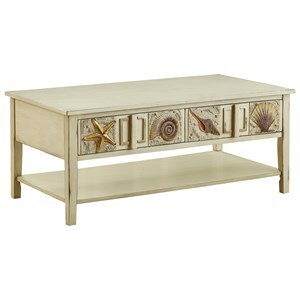 This one drawer Surfside end table will bring back fond memories of your last visit to the beach. 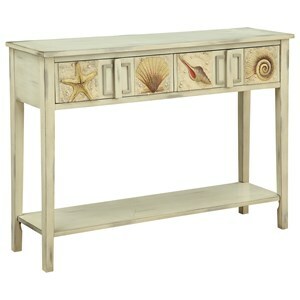 Raised seashells are proudly displayed on the drawer front and the Shoals Distressed Sand finish reminds you of that sandy shore. The lower shelf is prefect place to show off a basket or your favorite plant. The Surfside Surfside End Table by Coast to Coast Imports at Value City Furniture in the New Jersey, NJ, Staten Island, Hoboken area. Product availability may vary. Contact us for the most current availability on this product. Browse other items in the Surfside collection from Value City Furniture in the New Jersey, NJ, Staten Island, Hoboken area.